The Cadastre and Engineering Survey Company is a State business, directly dependent on the Ministry of Natural Resources and Environment with over 1300 employees (senior doctor, masters, engineers, technicians,etc) operating for business production in the field of cadastral survey, service in the land and environment management in the whole country. Name for International transaction: the Cadastre and Engineering Survey company in abbreviation C.E.S.C. 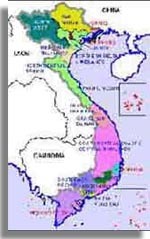 Legal personality according to the law of Vietnam . Private seal: having the Vietnamese money and foreign currency account at the State Treasury domestic and foreign banks according to the provisions of the law. Head office: No.30, Street No.3, Quarter 4, Binh An Ward, District 2, Ho Chi Minh city. Branch office: Pham Van Dong Street , Dich Vong Ward, Cau Giay District, Ha Noi. The company operates in compliance with the state enterprise law and other State regulations. The company is assigned capital, assets and another resources by the State to carry out its task. The company is responsible for keeping intact the assigned capital and assets, incessantly accumulating capital to invest for development, fulfill the financial obligation to the State. The company regularly improves the equipments, the technology and the management work in order to enhance the products quality . The company has over 40 years in traditional of surveying and mapping, and now, the main functions are: Mapping, Land managing and Environment in the whole country.